Bayco bracelet in 18-karat rose gold. 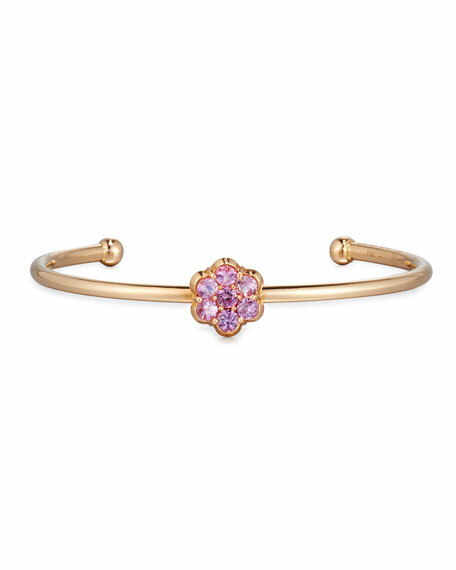 Round, prong-set pink sapphire create floral shape. 1.46 total pink sapphire carat weight. Alexis Bittar hinge bracelet with stone studs. Golden plating and rhodium-tone hardware. Hand-sculpted, hand-painted Lucite®. Crystal with natural malachite doublets. Alexis Bittar hinge bracelet with stone studs. Golden plating and rhodium-tone hardware. Hand-sculpted, hand-painted Lucite®. Crystal with natural malachite doublets. Clear crystals detail accent stations. Hinged opening eases dress. Approx. 0.9"H; 3"W. Made in USA.